All of Gibraltar Nursing Home’s family members are loved and accepted for who they are, always treated with dignity and given as much independence as possible. And all are considered legends, but only one is a legend in the world of rowing and has recently had a boat named after him! 83-year-old, John Hartland has been living at Gibraltar for the last four years and has an astonishing life history. He was the Master In charge of rowing at Monmouth School for Boys' Rowing Club for nearly 30 years and formed the Monmouth School for Girls Rowing Club in 1990. He also led the Welsh rowing team to the 1986 Commonwealth Games and was chairman of Welsh Rowing for helping more than 30 Monmouth rowers go on to win GB caps, including Olympic medallists Colin Moynihan and Charlie Wiggin, double Olympic gold medal coach Robin Williams, and his own son, two-time world medallist, James Hartland. John and his family decided he would move to Gibraltar after discovering he lived with Alzheimer’s which is a condition the home is excellent in providing care for. Gibraltar boasts a home from home feel with stylish décor, along with a hydrotherapy pool, cinema and restaurant, or private dining if preferred. On Saturday 6th April 2019, a sleek, new racing 8 was named after him in a ceremony at Monmouth Boys School Rowing Club. At the naming were Olympic medallist Charlie Wiggin and former Cambridge Boat Race chief coach, Robin Williams, who guided the GB women's pair to two Olympic golds. 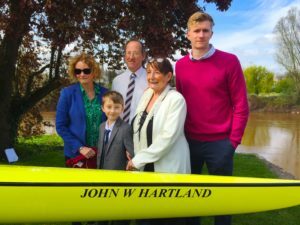 John’s wife, Ann Hartland, grandsons, Ben and Will, daughter, Kate Callaghan, the Head of Rowing at Monmouth School for Girls, and son, British veteran champion, Nick Hartland were there and watched proudly as Anne christened the boat with champagne, pleasing the large crowd of well-wishers that had assembled.